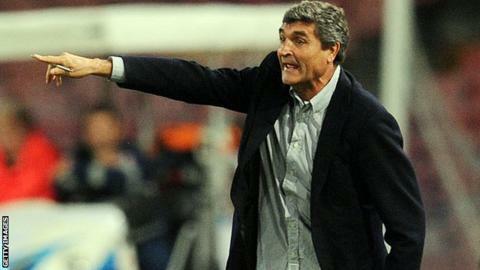 Tottenham have been drawn against former manager Juande Ramos's Dnipro in the round of 32 of the Europa League. Swansea will face Napoli, managed by former Liverpool and Chelsea boss, Rafael Benitez. Ramos guided Spurs to the League Cup in 2008 but was sacked after picking up just two points from eight games at the start of the following season. Tottenham will face either PAOK or Benfica in the round of 16 if they can beat Dnipro. If Michael Laudrup's Swansea can overcome Napoli they will come up against the winner of Porto's tie with Eintracht Frankfurt. After a year in charge, Ramos was sacked by Tottenham and replaced by Harry Redknapp in 2008 and the Spaniard has been in charge of Ukrainian side Dnipro since 2010. Tottenham sacked manager Andre Villas-Boas on Monday. Elsewhere, Italian champions Juventus have been drawn against Trabzonspor, Ajax face Salzburg and Lazio meet Ludogorets in the round of 32. The two legs for the round of 32 will be played on 20 February and 27 February.